Where do great watches come from? At Avio Milano they come from the minds of great designers. Italian watchmaker Fulvio Locci is widely regarded as one of today’s most talented young designers. Fulvio typically finds his inspiration in the world of aviation and motorsports and the enthusiasm he brings to the old world craft of watchmaking is contagious. When you watch Fulvio as he spontaneously sketches the design for the new Avio Milano Super Chronograph, you can’t help but like the man and the innovative timepieces he creates. The Avio Milano Super Chronograph shows Fulvio Locci’s unique design perspective with an interchangeable anodized aluminum bezel that allows the user to change the look and color of their watch at a moment’s notice. To change the bezel, all you do is remove four special screws on the front of the watch and choose another color. With six available color combinations, this sporty timepiece is ready for every mood and situation you might encounter. The 44 mm Avio Milano Super Chronograph exemplifies Italian design at its very best. The crisply contemporary black dial features bold luminous white hour markers and a tachymeter on the outer chapter ring. Three well-placed sub-dials allow virtually any event to be timed with ease. The watch is powered by a premium Miyota OS10 quartz movement and is equipped with a convex anti-reflective mineral glass crystal and a sporty black caoutchouc strap. The chronograph pushers are seamlessly integrated with the protected crown for a refined and unified appearance. The playfully clever video you’ve watched here captures the spirit of this boldly attractive timepiece. 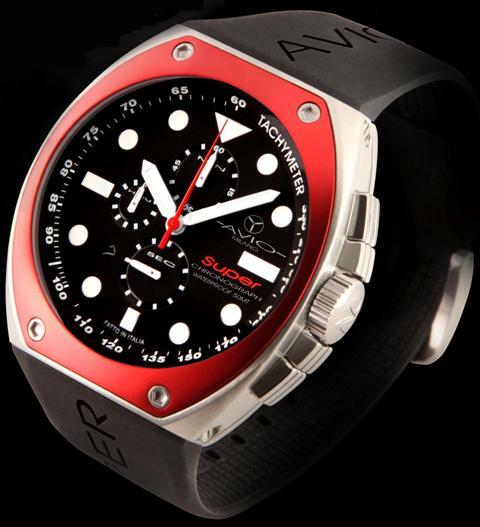 To fully appreciate the appeal of the Avio Milano Super Chronograph however, you’ll need to see one on your own wrist. To reserve your own Avio Milano Super Chronograph with its unique interchangeable bezel, contact an authorized Avio Milano dealer immediately.